Slugger IBF # 1 Felix Alvarado (33-2, 29 KO's) departed from his native Nicaragua en route to Manila, Philippines, ahead of his IBF Jr. Flyweight World Title battle against Filipino former world titlist Randy Petalcorin (29-2-1, 22 KO's) scheduled for Monday October 29 at Midas Hotel & Casino in Pasay City, Metro Manila. 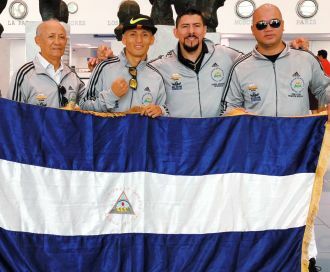 The dangerous 29 year-old Nicaraguan is flying together with his boxing team made of head coach Luis Ernesto Cortez, 73, coach Wilmer Hernández, 35, and promoter Pablo Osuna, 39, all Nicaraguan men of boxing. Veteran coach Cortez has worked in the corner of Nicaraguan legend Alexis Arguello (77-8, 62 KO's), while the younger Hernández is a cornerman and cutman who does the wraps for reigning WBC Flyweight Champion Crístofer Rosales (28-3, 19 KO's) and for star boxer Román "Chocolatito" González (47-2, 39 KO's). No doubt Felix Alvarado is supported by an experienced, knowledgeable team. 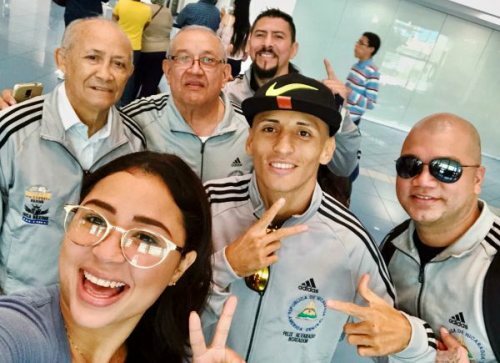 Felix Alvarado and Team in high spirits having a selfie with well-wishers at Managua Augusto C Sandino International Airport October 20. A small group of family and friends wished good luck to Alvarado and his team prior to their departure Saturday morning from Nicaragua's Augusto C. Sandino International Airport, as the group embarked on a journey that will take them to stops in Central America, Europe and Asia, before touching down in Manila. Their long journey finally ends when their last flight KLM flight # KL 807 lands in Manila's Ninoy Aquino International Airport Terminal 3 on Monday evening (Oct 22) at 6:45 PM Philippine Time. "I took care of my training during four months for this fight. I was waiting for South African Hekkie Budler, and I kept on training. Then, Randy Petalcorin was announced as my opponent for the IBF world title fight, and I can only say that I'm ready," commented Alvarado to Nicaraguan journalist Fernando Rayo. "I feel so confident for this fight than ever before," shared Alvarado, a two-time world-title challenger. A committed and experienced fighter, Felix Alvarado - whose nickname "Gemelo" means "Twin" - belongs to a family that breaths boxing. His twin brother, René Alvarado (29-8, 20 KO's), is a pro boxer, currently ranked as WBA # 1 super featherweight. Brother Rene is also rated by the WBC and the IBF and might fight for the world title next year. Félix Alvarado and his twin brother René aim at becoming world champions at the same time, a first in Nicaragua's rich boxing history. 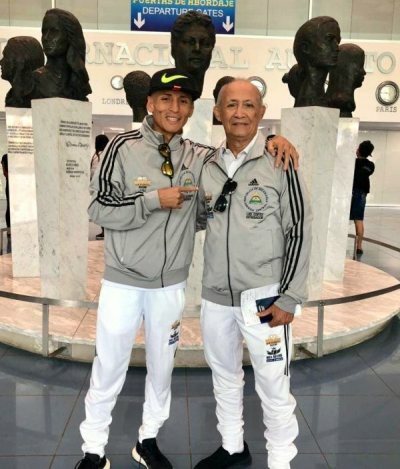 Felix Alvarado poses with his mentor and coach Luis Ernesto Cortez at Managua Augusto C Sandino International Airport on October 20. Will they be able to make it? Will Nicaraguan Felix Alvarado score his knockout # 30 to take the coveted Red & Gold Belt to Nicaragua, and be welcomed back in the land of Alexis Arguello as a hero? Or will shy Gensan kid Randy Petalcorin, 26, climb the ring at the Midas Hotel & Casino in Manila to score the most impressive win of his career in front of a big live TV audience that so much wants his win? The Randy Petalcorin vs Felix Alvarado fight for the IBF Jr. Flyweight world title Monday October 29 is a production of young Gensan award winning promoter Jim Claude Manangquil of SANMAN Promotions. For Nicaragua, the fight will be broadcast on Nicaragua's Canal 4.